While The Goldstone Wrap hasn’t been a blog where I’ve made any serious attempt to bare my soul to you (for that, read my memoirs when I’m famous 😉 ), I hope that it has helped to stir some of the joy, despair, disappointment, anticipation and nostalgia that comes from being a Brighton & Hove Albion supporter down the years. 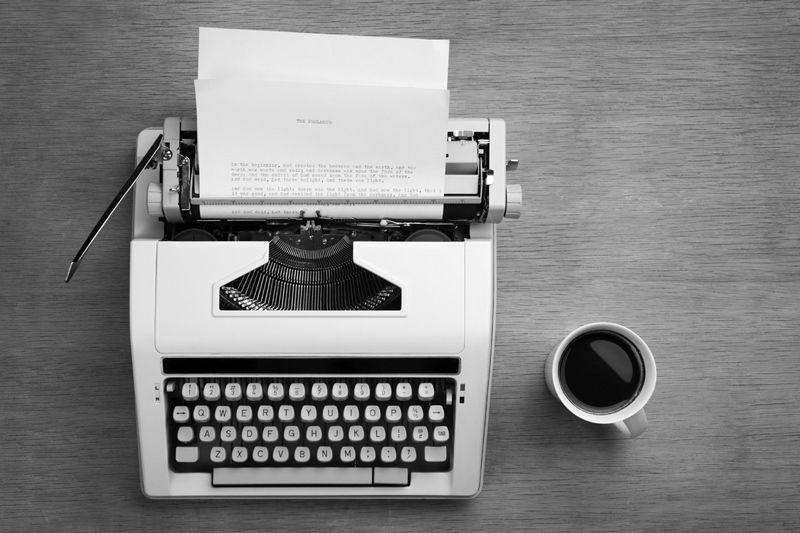 From 11th February 2013, I began writing this blog, aiming for one new post every day. Through covering past matches, players, managers and kits, my aim was to share a love of football via all the magazine cuttings and memorabilia that I had collected about the Albion down the years. It also gave me a good excuse to delve more deeply into chapters of the club’s history that I didn’t know that much about, such as the Freddie Goodwin, Pat Saward and Peter Taylor eras, tracking down old match reports along the way. And truth be told, I was also curious to see if there were other people out there for whom phrases such as ‘British Caledonian Airways’, ‘Farah Slacks’, ‘The Seagull Line on 8049’ and ‘Rediffusion Player of the Year’ created a warm fuzzy feeling! Today, it’s post number 500 on The Goldstone Wrap, and I feel it’s the right time to call time on it as a daily blog. I feel I’ve pretty much accomplished all that I set out to achieve, and didn’t wish to repeat myself too much. No seventh article on how Gordon Smith failed to score in the dying seconds of the 1983 FA Cup Final, in other words… I’ll spare you that. Thank you to everyone who has supported this blog on North Stand Chat, Seagulls Chat, Twitter and Facebook. Other blogs such as The Football Attic, Not Worth That, Brighton Lines and TSLR have also been very encouraging. Much appreciation also to those who have shared their memorabilia, video archives and newspaper cuttings. And major props to everyone who has subscribed on WordPress and those who have commented frequently such as Chris Worrall, Steve Cowdry, Richard H, John Mackie, scherben909, Giles Metcalfe, Ian Fennell, Jackie Dinnis, Chas Sargent, as well as Paul from Cult Zeros. Just to be clear, this blog is not going to die, exactly. All entries will remain online and I will add new entries every so often. It’s just it won’t be daily any more! Boo! As you’ve probably figured out by now, this blog’s name is a play on the title of the track ‘The Goldstone Rap’ but with ‘Wrap’ to signify that it’s kind of a publication. By a strange fluke, I recently discovered the blog’s title found itself into the managerial notes written by Mike Bailey in the Brighton v Tottenham programme of March 1982! In his eventful five-year spell as manager of Brighton, Alan Mullery managed to steer what had always been regarded as a typical Third Division club which did not always realise its true potential into the First Division for the first time in the club’s history. Having inherited a side from Peter Taylor, who rejoined Brian Clough at Nottingham Forest after just failing to take Brighton into the Second Division, Mullery went one better in the first attempt. And that was only the foretaste of what was to come as in the next season Brighton just missed out on promotion to the top flight. They achieved this by beating Newcastle 3-1 at St James’ Park in the final League match of the 1978-79 season. But despite Mullery’s confident prediction that Brighton would come through their tremendous test, the last two seasons have been a constant struggle for survival. Last season, speculation about Mullery’s future at the Goldstone started when he was closely linked with vacant managerial positiom at Crystal Palace and Chelsea. His resignation last month stunned everybody connected with the club, but chairman Mike Bamber wasted no time in naming Bailey as his successor. Within a week of Bailey’s appointment Mullery accepted an offer to take over at The Valley and so complete a remarkable managerial swap which took piece as follows. May 2: Speculation about Mullery’s future as Brighton’s manager continues despite their 2-0 victory over Leeds which assured them of another season in the First Division. “I wouldn’t want to give all this up easily – I like being a First Division manager too much. I’ve got my plans for next season and if the players show the same commitment that they have shown in the last four matches we’ll be a very good side next season,” Mullery commented. May 5: Mike Bsmber summons Mullery in for talks following – rumours of Mullery being linked with the vacant managerial job at Stamford Bridge. Mullery himself scotches this possibility and adds that if he felt he couldn’t do any more for Brighton he would walk out immediately. May 6: After discussing details of Muilery’s new three-year contract (which Mullery had accepted) Bamber refuses to confirm a report that in cash terms it is worth £35,000 a year. “I make a firm point of never discussing wages and salaries. The important thing is that Alan has now agreed to stay which means that we can continue our partnership,” Bsmber commented. For the next six weeks Mullery’s contract was in the hands of his solicitors, and it was not until the second week of June that there was any indication of the remarkable events which were to follow. June 8: Four days before leaving for a family holiday in Malta, Mullery had further talks with Bamber and appears to be nearer to signing his contract. But with Brighton £500,000 in the red the talks also centre round a broad policy for next season. June 12: On the day that Brighton’s fixtures are announced for next season, Alan Mullery ends his connection with the club in dramatic style. At a meeting attended by him, Bamber and two directors, Dudley Sizen and Tom Appleby, Mullery refuses to agree to cuts on his staff. After his departure Muilery stresses that the parting had been amicable. It’s been a great chapter in my life and I’ve got some very happy memories. I shell never forget that it was Mike Bamber who gave me my first chance in management. But what happened at the meeting this morning forced me to leave the club. “I haven’t quit over a contract or over buying or selling players. The directors and I were together for two and a half hours and made it clear that i was putting myself under pressure by adopting my stance. But I wouldn’t budge from certain proposals regarding members of the staff. I’m not worried about getting another job nor am I worried about not getting any compensation. All I want now is to get away and enjoy my holiday.” Before leaving for his holiday Mullery applied for the vacant manager’s job at West Bromwich Albion. 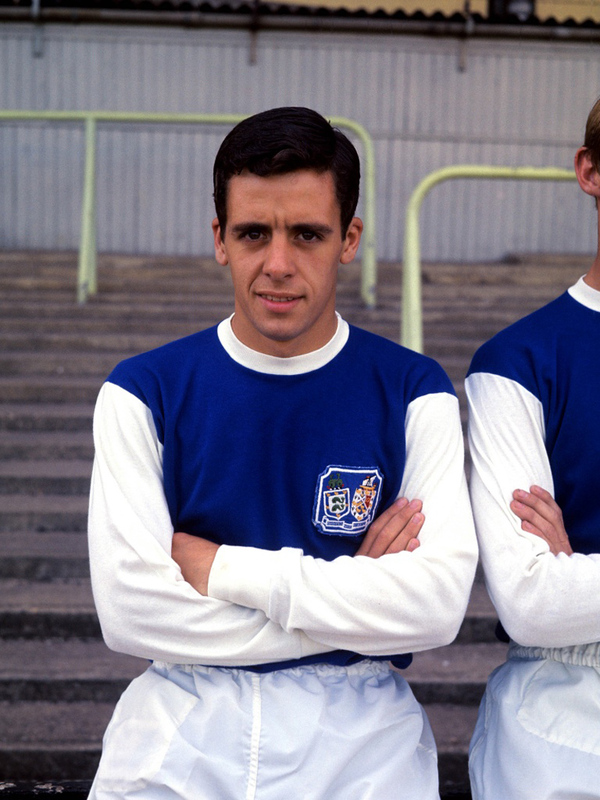 July 1st: Mullery finally loses patience with West Bromwlch Albion and accepts an offer from Charlton chairman Mike Gliksten which he describes as “one I would have found hard to refuse in normal circumstances. Now I can’t wait to get started at The Valley,” he added. 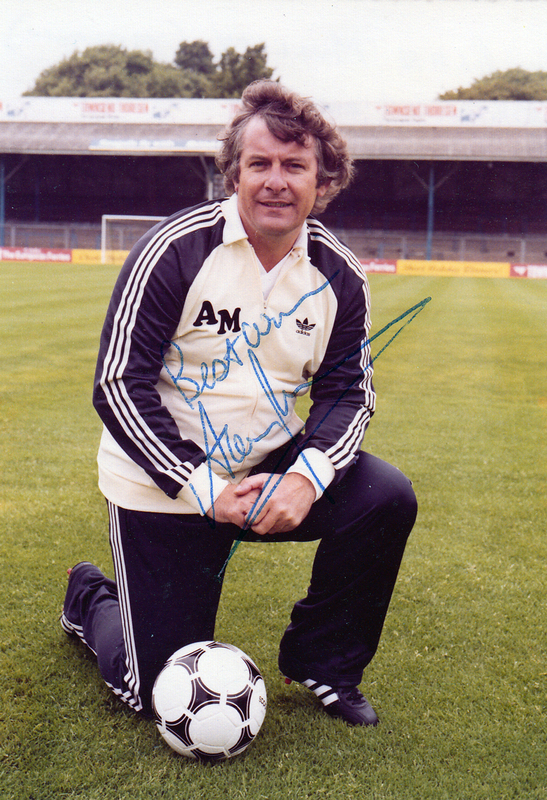 Although Brighton manager Mike Bailey has only seen his new club in action on the television end at reserve teem level, he needed no prompting to apply for the vacancy caused by Alan Mullery’s sudden departure from the Goldstone. His track record – both as player end manager – also impressed Mike Bambor who made no secret that Bailey was the front runner from the 100 applications he received for the job. “Mike may be relatively inexperienced as manager, but to my mind he proved himself by taking Chadton beck to the Second Division at first attempt last season. “That and our policy of giving young managers a chance here is why he was first choice from the ten names from which we made the final choice,” Bamber explained. 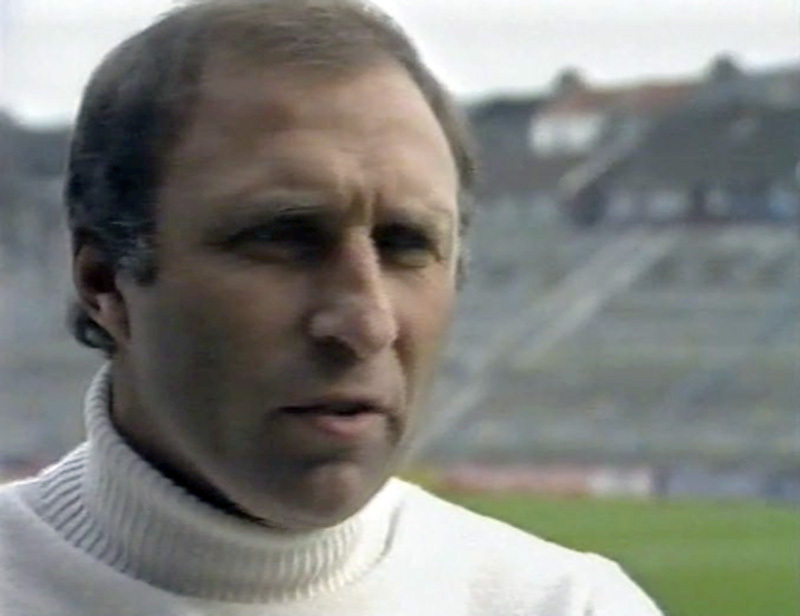 Even before meeting his players for the first time, Bailey spoke enthusiastically about becoming Brighton’s 12th post-War manager. ‘Obviously coming to a First Division club was a big attraction, but I’ve felt for some time that Brighton is one of those clubs which has a bit of sparkle which made it all the more pleasing to know that they wanted me. “You’ve only got to set foot in the club to see that it’s alive, and there’s so much potential here with players like Lawrenson, Robinson and Foster,” he said. Bailey is also convinced that having survived two seasons in the top flight, Brighton will take a big step forward in helping achieve Bamber’s next aim of bringing European football to Sussex. But he refuses to commit himself on whether he will employ the same tactics which saw Chariton win ten of their away games last season. “I think Brighton have done tremendously well in the last five years. For any club to stay in the First Division after being promoted for the first time shows they must be learning what life is all about among the elite. “It’s difficult to say what tactics I’ll use until I’ve seen the team play”, Bailey, continued, “at the moment I don’t know what their strengths and weaknesses are. In the end, Bailey can’t have thought much of Albion’s chances as an open, attacking team, and a tight defensive unit proved his way forward as Brighton bored their way up the table under his leadership! 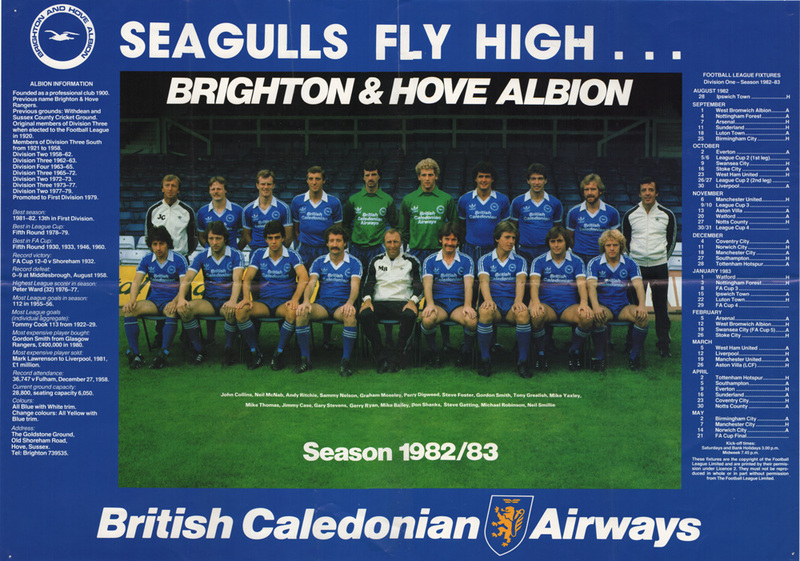 Still, it seemed to work for a time on the pitch during the 1981/82 as the Seagulls mounted a bid for a UEFA Cup place. 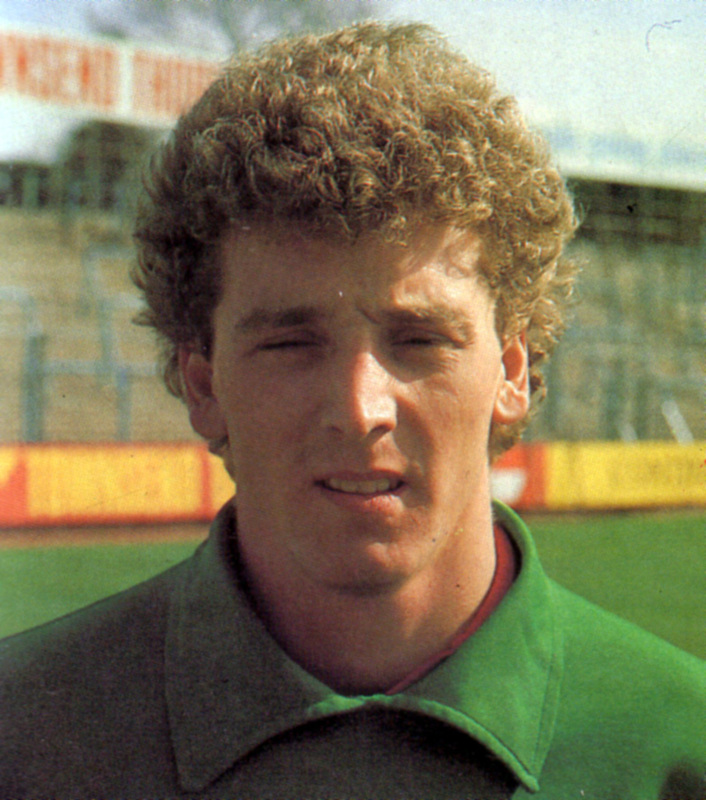 However, poor form eventually cost Bailey his job in December 1982. As for Mullery, he lasted a season at Charlton where an unlikely period in the upper echelons of the table also had supporters giddy. 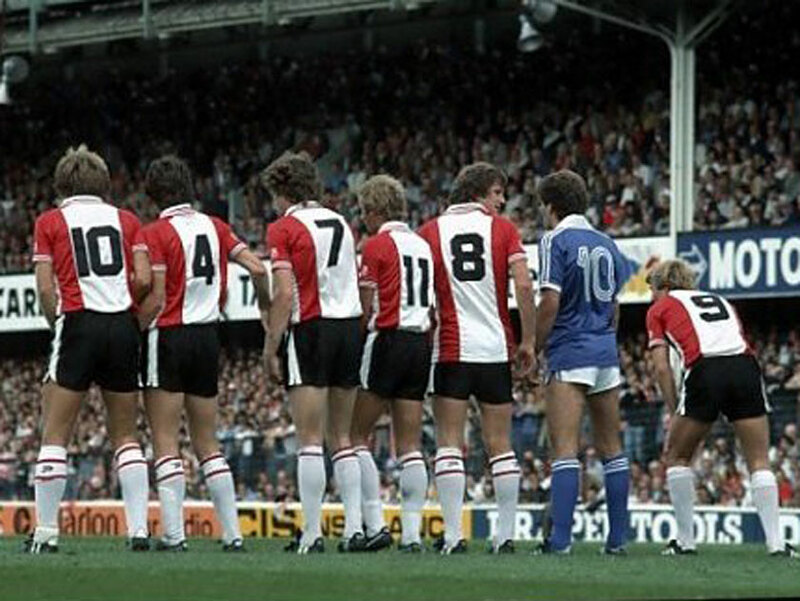 Indeed, Athletic stood in fifth place as late as 30th January 1982. An incredible achievement for a cash-strapped club. However, just as with Bailey at Brighton, the unexpected run of form also fizzled out and Mullery left for Crystal Palace. The defensive discipline which has been the cornerstone of success on Brighton’s travels emerged triumphant again at Anfield. An untidy goal snatched five minutes before half-time was enough to cost Liverpool vital championship points. Alan Hansen could only watch in despair as Andy Ritchie’s shot struck his knee to skid over the line. …were well beaten by a combination of an own goal and a wicked pitch. Take that moment 13 minutes from time when Grealish committed a horrific back pass to give Rush an equaliser on a plate. The Liverpool man hit the ball towards an empty net from some 12 yards, it suddenly stopped in the mud and was cleared. For a display of character and defensive ability, Albion’s performance could not be faulted. The spectacle, while being almost entirely one way, was full of excitement and passion as Albion gradually came to terms with the demands imposed Liverpool on visiting sides. But that is not to say that Albion didn’t stretch Liverpool’s defences and there were times when the European champions were forced to sweat it out. Everybody performed beyond the line of duty in this action packed drama and Digweed, brought in on the big occasion, had an excellent game. To come to Anfieid and play like this was the highlight of Albion’s season so far, and reinforced the view that their best games have all been away from the Goldstone. “The result at Liverpool was one of the most satisfying it is possible for a manager to get. Although we were all very happy after the game and it was a good journey home, I don’t think the players realised quite what they had achieved. Not many teams go to Anfield and come away as winers, and I certainly never did it as a player. It just shows how far this club has come in the last few years. Five years it would have been unthinkable for Brighton to have gone to Anfield for a League game and come away as winners. 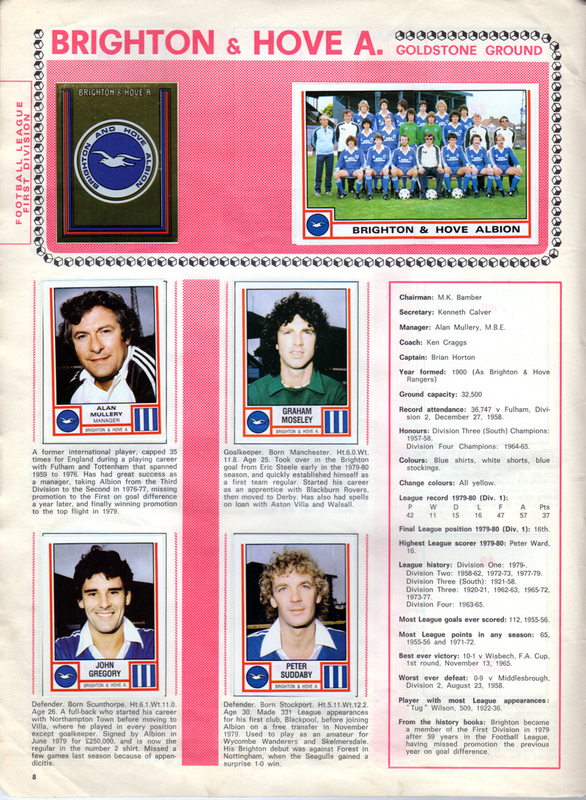 The wind of change blew in 1981/82, and not just for Brighton & Hove Albion. Panini introduced new stickers with a tweaked layout. While the head and shoulder shots remained, the photos now sported rather spatially uneconomical oval frames instead of the standard rectangle. Elsewhere, the one year experiment with two stickers for a First Division club squad photo was abandoned, with team groups reverting back to one sticker. Of the other teams, Steve Gatting still appears on the Arsenal pages even though Brighton signed him quite early on in the season, in September 1981. Panini clearly didn’t get round to updating their stickers. 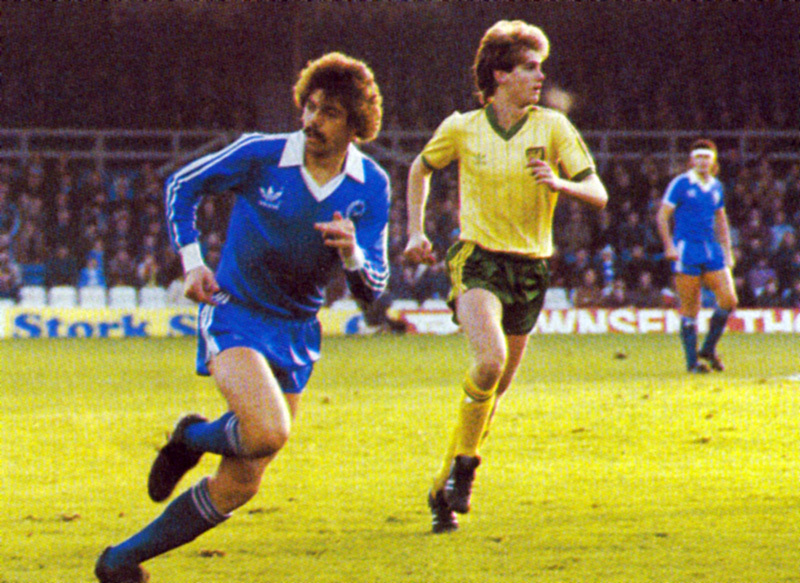 The Welsh rapscallion Mickey Thomas is also on the Everton spread, despite his ill-starred spell at Goodison Park. 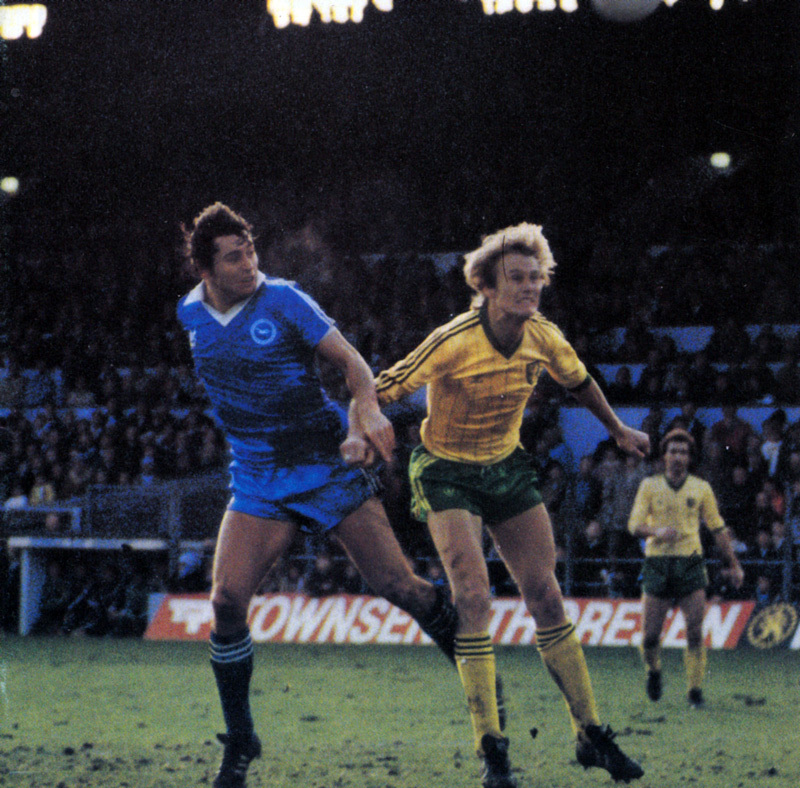 His time with Brighton in the same 1981/82 season proved just as disastrous. And, surprise surprise, Peter Ward makes no appearance in the Nottingham Forest pages. Perhaps that’s fitting. 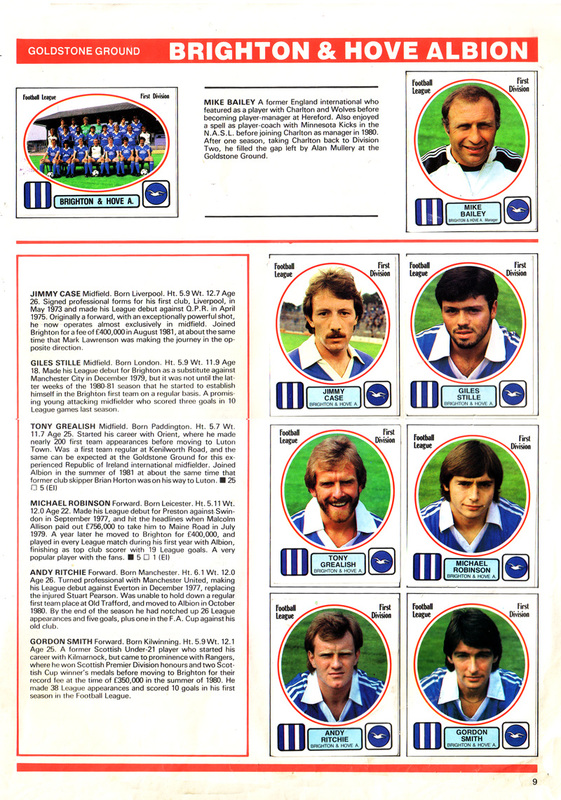 As a sticker collection, Football ’82 was a bit like Brighton & Hove Albion that season: solid, no thrills and not very much flair. 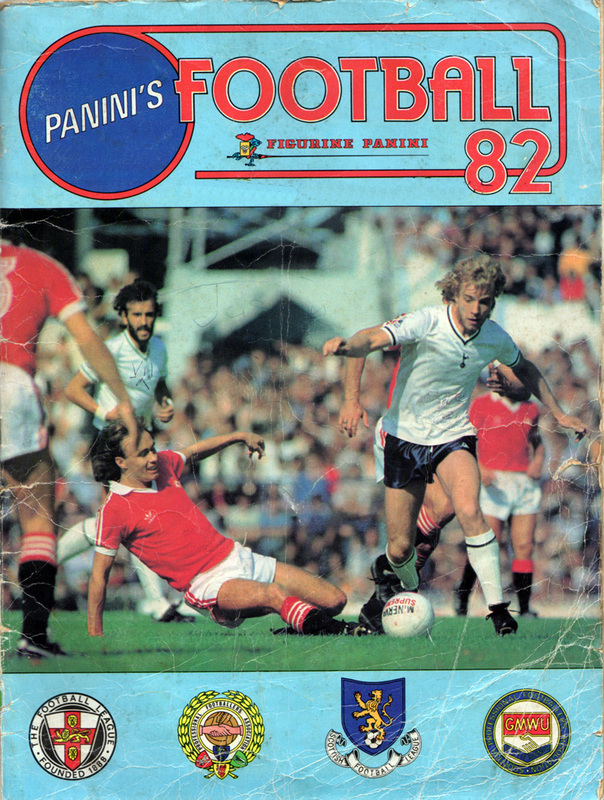 All that would change the following season when Panini added a healthy dose of innovation back to its flagship football sticker collection. 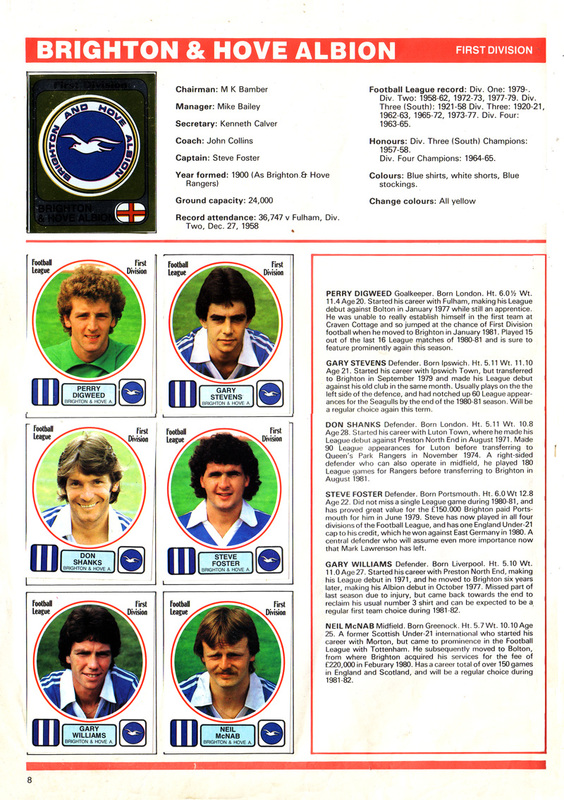 Brighton fans may have initially balked at getting a sticker album with Crystal Palace’s Gerry Francis on the cover, but I’m sure they got over it! Besides, Palace’s season was a disaster. They even had four different managers during the course of the 1980/81 season, none that could arrest their slump. Even Ray Wilkins’ side, Manchester United, sacked theirs, ex-Albion player Dave Sexton, at the end of their own disappointing campaign. Interesting to see Mark Lawrenson listed here as a midfielder. He had performed that role admirably in the second half of 1979/80. Would Albion fortunes have been different had he stayed there in 1980/81? He, alongside Ward and Horton, also departed the Goldstone not long after the publication of this album. 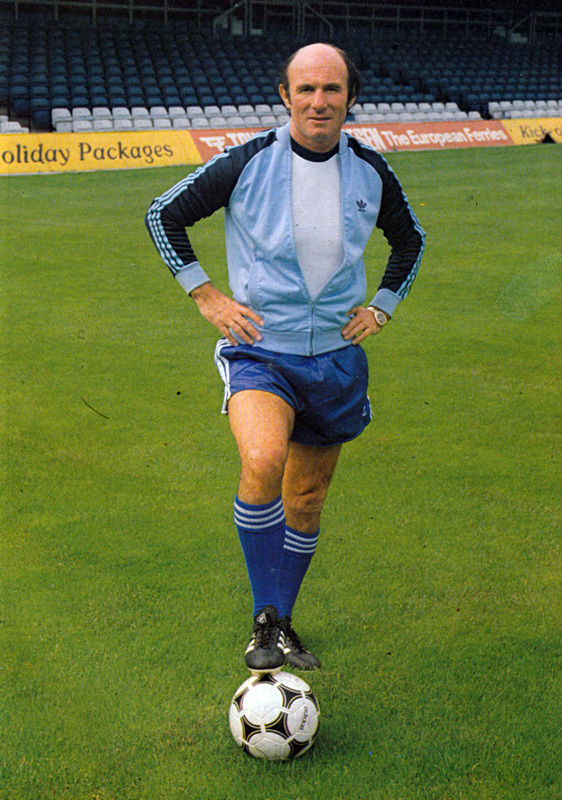 We are also treated to a rare shot of Peter Sayer in our new fangled Adidas kit. Sayer was an unused sub on the opening day match against Wolves before leaving for Preston North End. Notable absences here are Perry Digweed, Gary Stevens and Andy Ritchie, all of whom made a significant number of appearances during the course of the season. This album is notable for the first appearance of team groups being made up of two stickers rather than one. Looking through the album, there are some alignment issues with some team groups, but happily, the Brighton one looks fine. Second Division clubs were also given the half and half treatment, and it’s possible to clearly see Ray Clarke at his new club, Newcastle United. 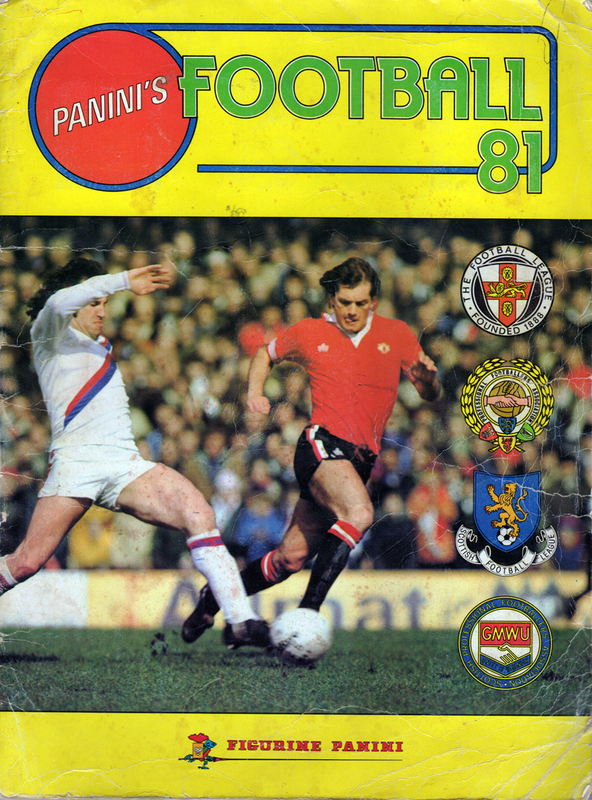 Even Third Division clubs were covered by Panini at the time, albeit with a single sticker team photo. 15mm tall in Charlton’s team sticker was Mike Bailey. Little did Albion fans know it in 1980/81, he would be man to bring forth a new era to the Goldstone, and a whole lot of new player stickers to collect! 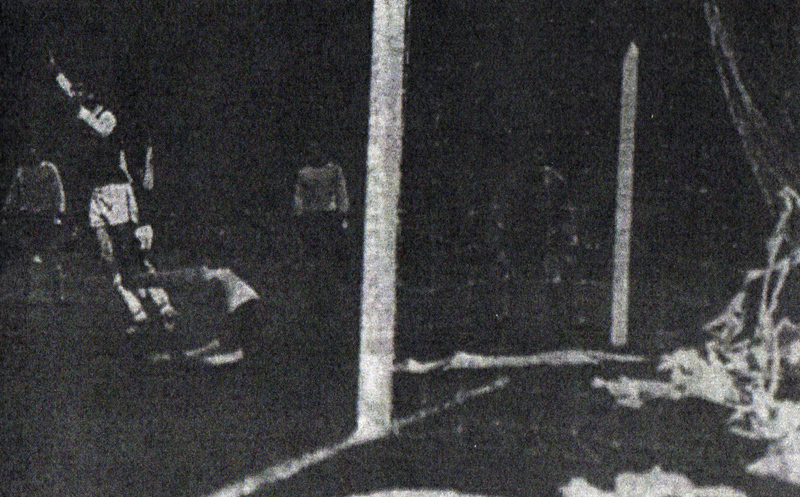 The League Cup captured the imagination of Sussex in the autumn 1969. In August, Freddie Goodwin’s side put one over south coast rivals Portsmouth, with Alex Dawson getting the only goal, Then the Albion toppled First Division side Birmingham City, 2-0, in front of 24,232 supporters to set up a mouth-watering third round tie with mighty Wolverhampton Wanderers on 24th September. Front row: Howard Wilkinson, Alex Dawson, Kit Napier, Eddie Spearritt, Freddie Goodwin (manager), Nobby Lawton, Willie Bell, Allan Gilliver, Brian Tawse. Sitting: Martin Tew, Keith Watkins, Michael Stanley, Garry Parsons. As you can see, Wolves’ skipper was Mike Bailey, who would go on to lift the League Cup trophy four and half years later, in an entertaining 2-1 victory over Manchester City in 1974. Unfortunately, injury kept him out of this match. Had he travelled to the Goldstone, he would have seen a huge crowd of 32,539 supporters. What a contrast to the falling gates when he took over as Brighton boss in 1981. Albion should have beaten Wolves out of sight at the Goldstone last night. For close on 70 minutes they were Wolves’ masters and thoroughly deserved a 2-1 lead with Hugh Curran, the player Albion tried hardest to subdue, won the game with a two-goals-in-eight-minutes burst. So Wolves entered the fourth round of the Football League Cup when it looked for so long like a major upset before a 34,000 crowd that set up a floodlit ground record. The 3-2 skin-of-the-teeth success was highly flattering to a side standing fourth in the First Division. But in the final analysis they displayed their class by twice coming back to steal a place in the last 16. They owed it all to Curran whose stealth stamped him as a superb turner of half-chances into goals. 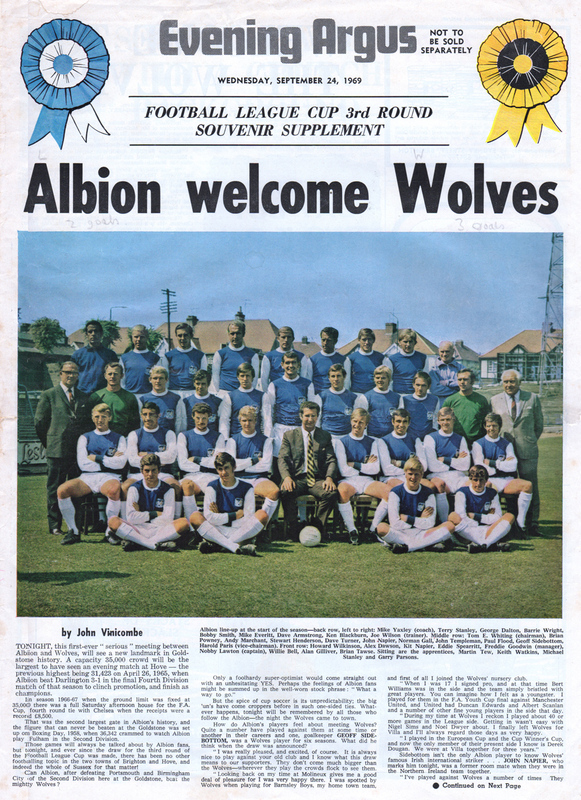 Yet Wolves were given a tremendous fright by an inspired Albion, and were unable to find their bearings without Mike Bailey supplying the drive and Derek Dougan his own brand of inspiration. 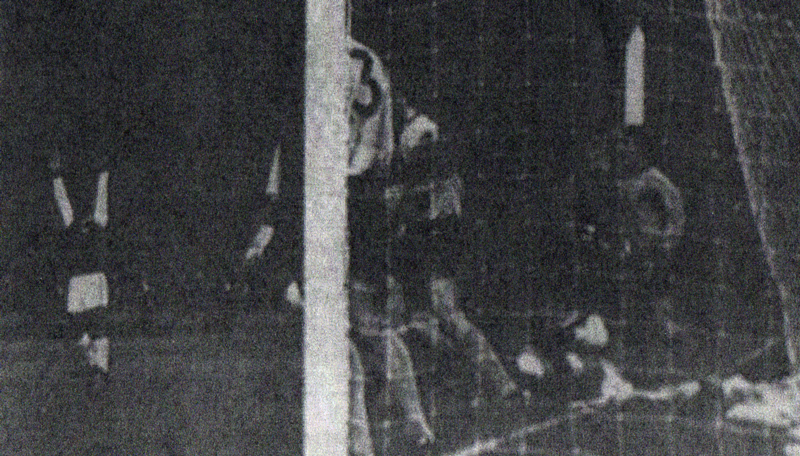 On nineteen minutes, Albion took the lead when Kit Napier’s inswinging corner was missed by Wolves keeper Parker, who seemed more worried by big Alex Dawson. He seemed to push Dawson, which may have warranted a penalty, but Allan Gilliver showed his goal touch to squeeze the ball home at the far post. 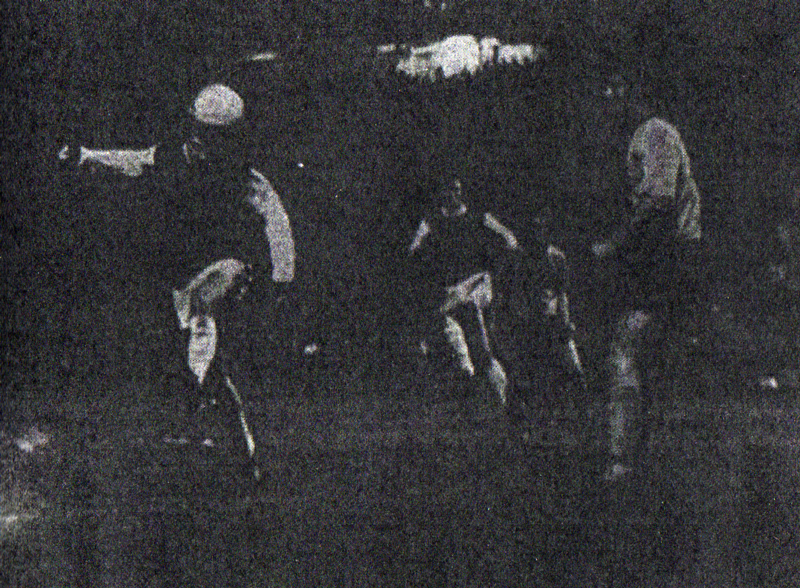 However, Wolves hit back twelve minutes later when Wagstaffe intercepted Nobby Lawton’s pass. The Wolves player ran on and on, and it became one on one with Geoff Sidebottom once John Napier slipped. He then fed Woodfield who slotted home the equaliser. …which disappears in a mountain of toilet roll in the back of the net. On the stroke of half-time, though, Brighton delighted the home crowd by retaking the lead. Kit Napier’s free-kick found Eddie Spearritt who guided a header just under the crossbar. With Albion dominant, an upset was on the cards. But Wolves were not finished, and Hugh Curran raced on to a huge defence-spliting goal kick from Parkes to equalise with twenty minutes to spare. Curran then broke Albion hearts on 78 minutes, making the most of a mix-up at the far post. Sidebottom and Turner had left it for each other to deal with Wagstaffe’s harmless looking cross, allowing Curran to nip in. Even so, Albion played stoutly during the evening, none more so than Stewart Henderson who had a storming match. Henderson, a small and classy right-back, would go on to be voted by supporters as their Player of the Season. Brighton breezed into Southampton last night like a gang of gate crashers. But for a team hoping to stage an exclusive party, the Saints left the door invitingly open for intruders. The victory that would have put Saints proudly on top of the First Division for the first time in their history never seemed a remote possibility, the occasion proving more inhibiting than inspirational. The style and the skill that brought them victory over Manchester United last Saturday seemed like a dim and distant dream on this disappointing night. Brighton, of course, were a different proposition to United, first frustrating Saints with the depth and meanness of their defensive football and then breaking out to steal the vital goals in the second half. Even so, one did not expect players with the experience of Chris Nicholl, Alan Ball, Mike Channon and Kevin Keegan to buckle under the significance of the night. A hardening pitch on a sub-zero night and the inconsistencies of Oxford referee Dennis Hodges are hardly adequate excuses for Southampton’s failure. A side chasing the championship should have shown more imagination and inventiveness when it was so obvious that the long high ball into the middle was courting frustration. For centre-half Steve Foster, increasingly an international candidate, picking off the centres like a kid raiding apples from an orchard. Perhaps Brighton are sometimes excessive in their handling of opposition forward lines but an away record this season of only two defeats underlines the effectiveness of their policy. Last night they had three players cautioned – Foster, Gordon Smith and Sammy Nelson – and if Foster is to make the grade at the highest level he must not prod referees in the chest with an outstretched finger when the book comes out. In a goalie’s first half both sides had a scoring chance. Southampton’s Steve Moran and Brighton’s Gerry Ryan both being denied by good saves. But in the 63rd minute Brighton took the lead from Andy Ritchie, only in the side because of injury to Michael Robinson. Three minutes later Brighton put the game beyond Southampton’s grasp. Mike Thomas crossed from the left and when Foster’s header rebounded of a defender Steve Gatting prodded the ball home. 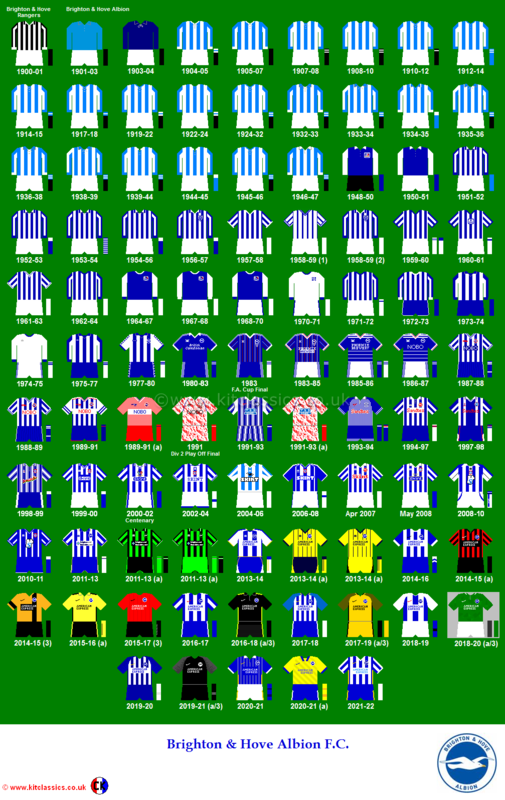 In denying Saints their moment in history, Brighton made history themselves by moving up to sixth place in the First Division – the highest they have achieved. 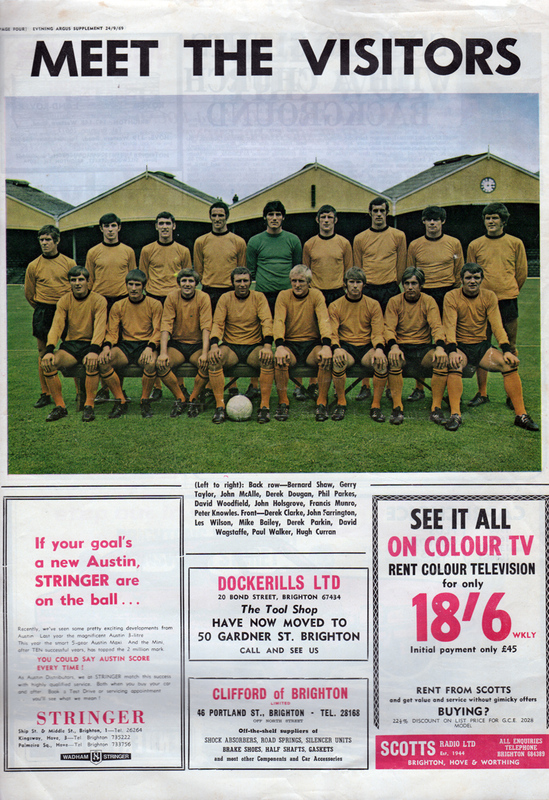 The result actually put Albion in their second highest ever League position, having occupied fifth spot in Division One in August that season, when an Andy Ritchie goal put Wolves to the sword. While one place off, sixth was a welcome place to be and gave rise to the hope of securing a UEFA Cup spot. The Arsenal hoodoo was well and truly broken. Having been the Gunners’ whipping boys in the time that Brighton had been a First Division club, the Seagulls achieved a second successive victory over their more distinguished opponents. On Tuesday 7th September 1982, following away thrashings at West Brom (0-5) and Nottingham Forest (0-4), Mike Bailey’s men showed that Goldstone was still a fortress with a superb win. Arsenal’s £1 million ticket to ride to the League title is already being declared null and void by the rest of soccer. They have invested heavily in strikers Tony Woodcock and Lee Chapman to provide the finishing touches to a team renowned for outstanding organisation and resilience. But the Highbury horror story is that Arsenal have managed only one point from their opening four matches. In fact, after tonight’ fixtures, the club which has never known the ignominy of relegation could be bottom of the First Division [not true. Arsenal were relegated from Division One in 1903-04]. 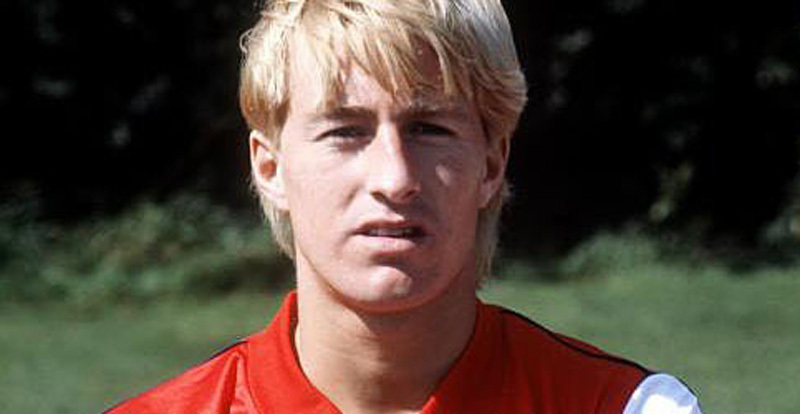 Woodcock has begun his Highbury career with a little more style and panache than his unhappy partner, Lee Chapman. A goal for Chapman, signed from Stoke, would provide a massive boost for his flagging confidence and he was unlucky not to get one last night with a fine header in the 33rd minute that was hacked off the line by Tony Grealish. On the hour Chapman tried again from a John Hollins corner but his firm header thudded into the chest of goalkeeper Perry Digweed. Brighton emerged as victors with a display of guts and determination, following the crisis meeting of all the staff with chairman Mike Bamber on Monday morning. Internationals Steve Foster and Mike Robinson, who have both been seeking to leave the club, were both left out of the team, along with midfield player Neil McNab. Gerry Ryan, in for Robinson, scored the all-important goal in the 32nd minute – a firm, incisive finish from close range after clever creative work by Giles Stille and Gary Stevens. The considerable influence of injured full-back Kenny Sansom and striker Alan Sunderland was missed by Arsenal who are surely capable of much better than this when those two are available for selection again. 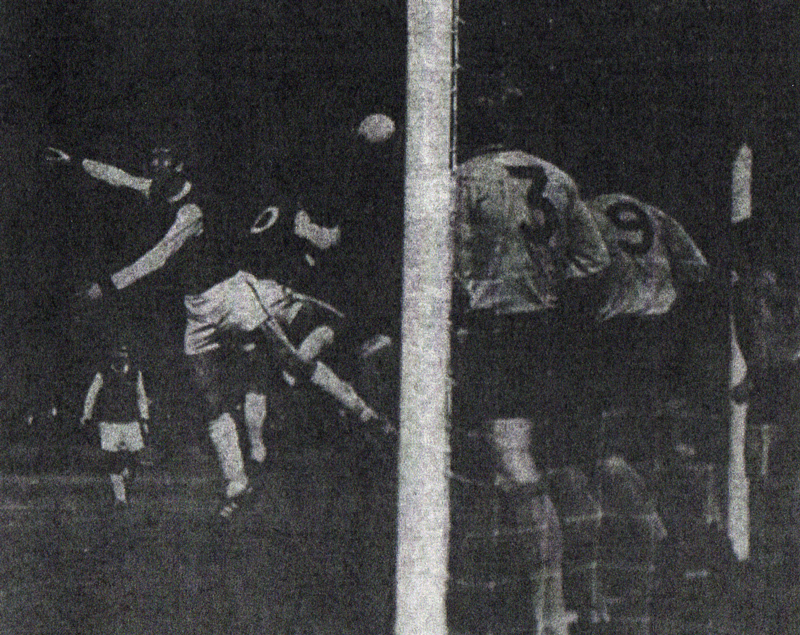 The Gunners were hardly helped by the loss of midfield player Brian Talbot at half-time. He had spent most of the opening 45 minutes in obvious pain after a juddering collision with Jimmy Case. This sweet victory calmed the nerves at the Goldstone, taking Albion out of the relegation zone into 16th position. As for Arsenal, they fell to 21st place by the time the following evening’s games were concluded. ‘Following our disappointing results at West Bromwich and Nottingham Forest I was delighted with the performance against Arsenal here at the Goldstone on Tuesday. After things went so very wrong at the City Ground we were looking, on Tuesday, for 100 per cent commitment from everyone, and I was very pleased that the lads gave just that against Arsenal. Brighton are fighting for First Division survival after the departure of manager Mike Bailey. What hope for the club that brought football glory to Sussex by climbing from the Third Division to the First in three years but have since fought desperately to avoid relegation. SHOOT investigates Brighton’s catalogue of problems and turns the spotlight on Mike Bamber, the chairman who wants to be manager as well. When Brighton were promoted to the First Division three seasons ago it seemed like a Iicence for the club to print money. They had been magnificently supported, but the crowds melted away as two gritty battles against relegation were fought by Alan Mullery. Then, last season under Mike Bailey, Brighton appeared to have turned the corner in finishing a respectable 13th, the highest position in their history. Now, following Bailey’s departure early last month, Brighton, amid falling gates, are fighting all over again to establish themselves. Alarmingly, there are cracks appearing in the Goldstone structure, and some disgruntled fans have even said they’d be better off in the Third Division. It is a fact that Brighton have never attracted 30,000 crowd since they went up, yet there is well-heeled catchment area that hasn’t been visibly hit by the recession. The season was only a few weeks old when two key international players, Steve Foster and Michael Robinson, asked for transfers. Then Nell McNab said the chairman’s involvement extended too far. McNab alleged that he picked the team. The fuss died down, and Foster and Robinson later said they were willing to stay. McNab, who is also on a lengthy contract, turned down a move sending him to Newcastle on loan, and has since joined Leeds United on a temporary transfer. While the basis of Foster’s gripe was money he considered a rise was due after getting into England’s World Cup squad, Robinson’s quarrel, besides being financial, raised other questions. He accused the club of lacking ambition, and this was triggered when Bamber refused to back Bailey up in giving Charlie George a month’s trial. It was Robinson’s opinion that the chairman should also have given Bailey a contract. After putting his cards on the table, it looked as though Robinson would leave. But he declined a berth at Sunderland, and was later wooed by Arsenal and QPR. Foster’s dispute had been settled previously, and he did not identify with Robinson all the way. But McNab’s bluntness in challenging his chairman was a blockbuster. 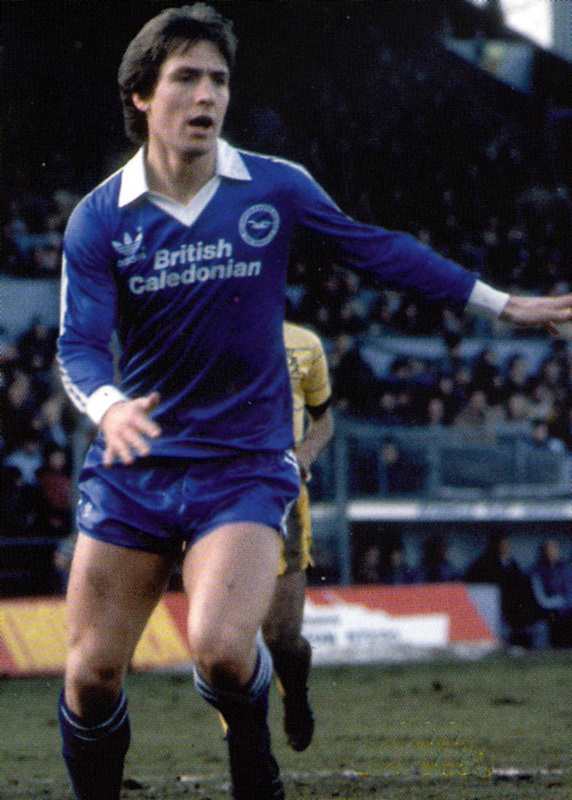 Bamber brought about the return of Peter Ward, Brighton’s former record scorer, on loan from Nottingham Forest. He saw him as not only a vital crowd-puller, but the man to link-up best with Robinson. Brighton have only got him until the end of next month, but he did the business by scoring the winner against Manchester United on November 6 when the gate was a satisfying 18,398 – an increase of 8,000. The inclusion of Ward put Andy Ritchie’s nose temporarily out of joint, Brighton’s most expensive signing at £500,000 from Old Trafford stayed in the reserves for six weeks and only re-appeared when Bailey left. And another big-money player, Gordon Smith, who cost £400,000 from Rangers, went back to Glasgow on a temporary transfer. The principal reason was to help Rangers in the Scottish League Cup Final against Celtic. But all Smith got was a runners-up medal that was stolen the same night when his car was vandalised. Smith, like most Brighton players, is also on a long engagement. But he’s in a whirl. 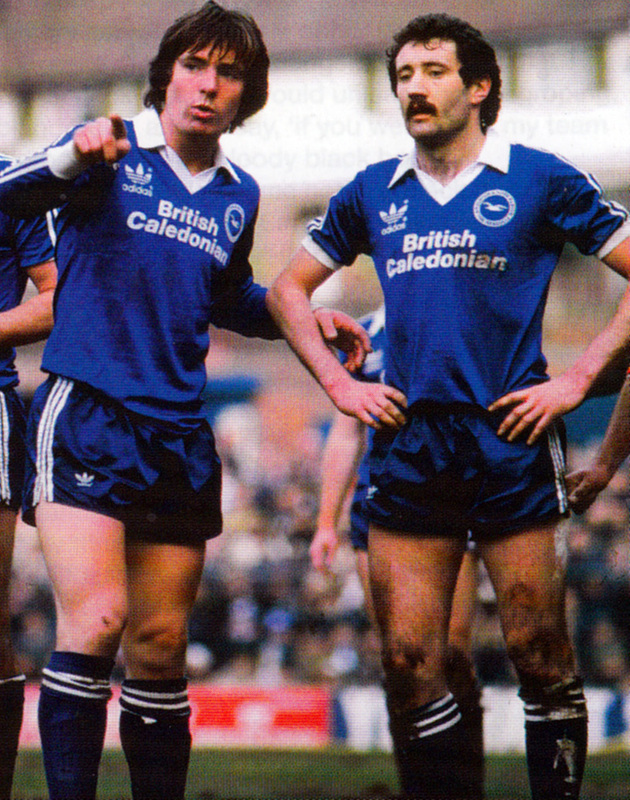 Perhaps Brighton’s biggest mistake was signing Mickey Thomas from Everton. Over £400,000 was involved, and the Wales international couldn’t put a foot right. He gave domestic reasons for several acts of truancy that held Brighton up to ridicule. Fines and suspensions didn’t bring him into line. But once transferred to Stoke, Thomas showed his real worth. Brighton cannot afford another mistake like that, and it is very doubtful they will be able to recoup anything comparable to the fee paid for Smith. Bamber disclaims responsibility, saying the down-turn in the market has put many clubs in trouble, and Brighton are no exception. Enjoy Jimmy Case’s rocket with his left foot, the close control and creative play of Peter Ward, and Andy Ritchie’s curling free-kick. Unfortunately, it proved a false dawn. Albion failed to win their next ten League matches, a poor run that plunged the club from 18th to bottom of the division by the start of March. By then the media circus over the FA Cup run gripped the club and First Division survival became of secondary importance. It’s hard not to feel some sympathy for Mike Bailey, Brighton’s 11th manager since the War. He gained a fine reputation as an attacking wing-half with Wolverhampton Wanderers, and before that Charlton Athletic. He was at his best at the time when English football was rich in midfield talent, a factor which prevented him from winning more than two full England caps to add to his five appearances for the Under-23s. Bailey has found management a far harder proposition. 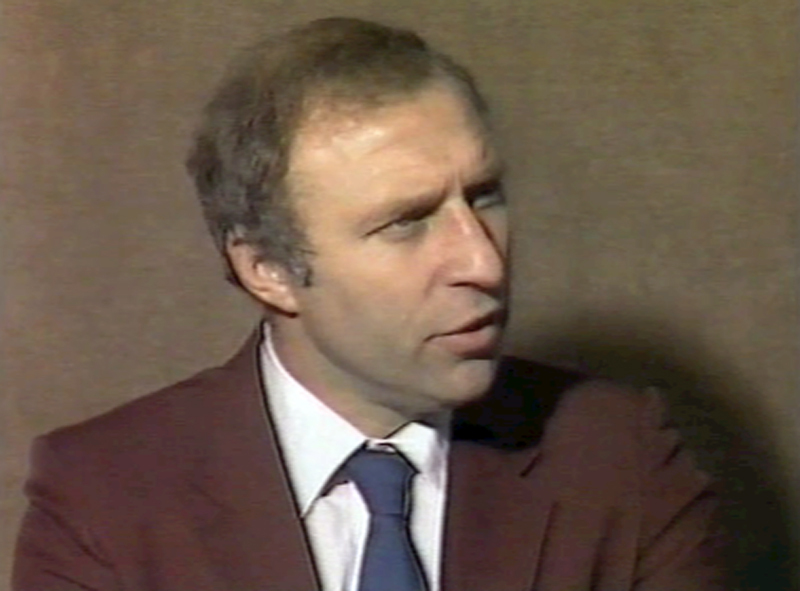 He did well to steer Charlton to promotion from the Third Division in the 1980-81 season, a success story that persuaded Brighton chairman Mike Bamber that he was the man to replace Alan Mullery. He inherited a bed of thorns when he breezed confidently into the Goldstone Ground in June 1981. They narrowly escaped relegation from the First Division two months earlier and there was no reason to believe he would lead them into calmer waters the following season. 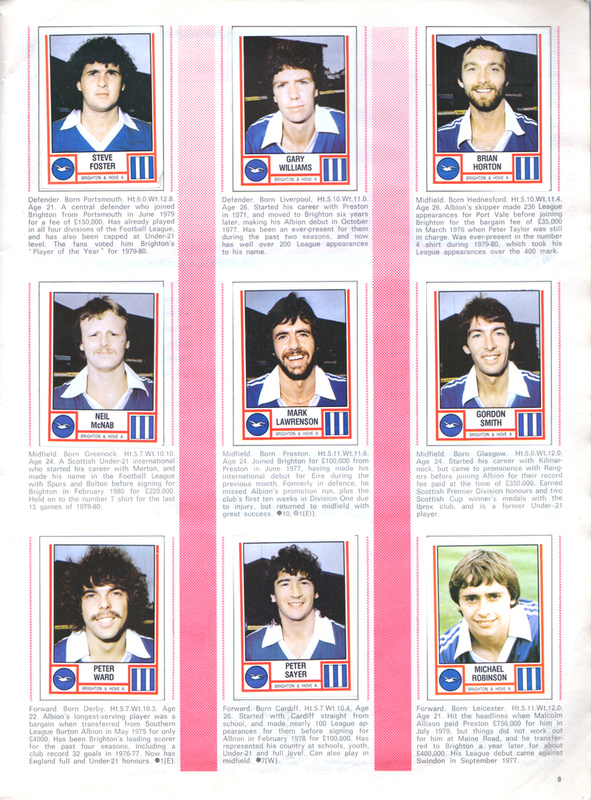 As it turned out, Brighton finished in a highly respectable mid-table position at the end of the 1981-82 season, unbeaten in 26 of their 42 League games. Bailey, in common with other bosses of less wealthy First Division clubs, has had to summon all his reserves of energy and enterprise to consolidate Brighton as a First Division side. Unfortunately, his 18-month reign has given him heartache and happiness in equal proportions. One moment Brighton send one of the mightier First Division clubs crashing in unexpected defeat – as they did in beating title-chasing Manchester United last month – the next, the manager has to wrestle with some crisis that threatens both his, and the club’s, future. Mike Bailey’s enterprise in signing Mickey Thomas from Everton, Jimmy Case from Liverpool and Tony Grealish from Luton was warmly applauded by the Brighton fans. Sadly, they did not always fulfil their manager’s vote of confidence. Thomas was transferred to Stoke after a short, unhappy stay and neither Case nor Grealish have turned on the power they did at their previous clubs. The atmosphere at the club this season has not always been as happy as in the past. Stalwart first teamers Steve Foster and Michael Robinson both declared they want to leave before the start of the season, and they might well have gone if rival First Division clubs were not feeling the same economic pinch. Fortunately for Brighton, they stayed. Foster to shore up a defence that ships water whenever he is out of the team, and Robinson to lead an attack that lacks punch if he is missing. Brighton appear to have solved most of their problems and can look back on their start with some satisfaction. League victories over Arsenal, West Ham and Manchester United were marvellous tonic for Bailey, who smarted from crushing defats at West Bromwich Albion, Nottingham Forest, Luton and Stoke. No manager works harder than Mike Bailey and no boss deserves to be given more time to establish the consistency Brighton need if they are not to continue worrying their fans to death. Unfortunately for Bailey, he could not restore the club to health. Attendances continued to fall as Bailey struggled to shrug off the accusation that his side was ‘boring.’ Results also turned for the worse. The unbeaten home run in Division One fell at the end of November, with Albion going down 2-0. 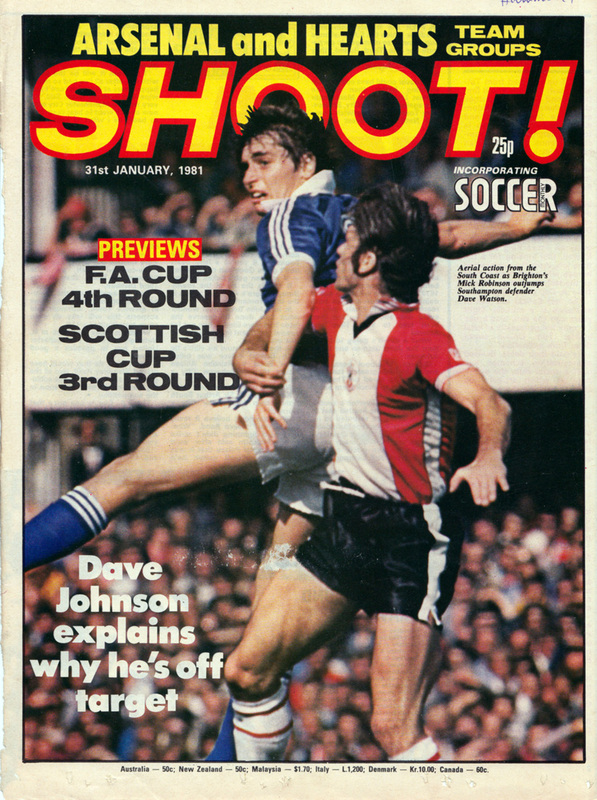 On 4th December 1982, the Brighton side slid to a fourth successive defeat, another 2-0 scoreline, this time at Coventry. Two days later, Bailey left the Goldstone by ‘mutual consent’, alongside coaches John Collins and Brian Eastick.